With Fall less than two weeks away, it is time to get our last bites of summer in before the seasons change. Eating seasonally is a leanmazing way to ensure you’re consuming a variety of foods while they contain the most nutrients. A really good dish to help transition from summer to fall is the chicken taco bowl. MAKE SURE YOU SIGN UP FOR FREE WEEKLY LEAN RECIPES, WORKOUTS AND LEAN TIPS BELOW! Fresh corn on the cob, bbq’d chicken and avocados are some of our favourite summer staples. Sweet corn, especially in season, is not only sweet and delicious but is high in fibre, an important component for digestion. Avocados are loaded with healthy fats to help keep hunger at bay and keep us filled with energy. One of our top summer recipes (although it can be enjoyed all year round) is this grilled chicken taco bowl with avocado corn salsa. It can be made heartier in the fall/ winter months with some beans, squash, caramelized onions or braised meat. These lean chicken taco bowls are super simple to make, are packed full of flavor and take less than 25 minutes to cook. To make it a lean low carb meal substitute cauliflower rice or for a lean refuel choose a whole grain such as brown rice or quinoa (loaded with protein). Top with some fresh cilantro, parsley, lime juice, red pepper flakes or whatever your taco heart desires and enjoy! Now, before we get this lean party started, I just want to clarify a couple things. 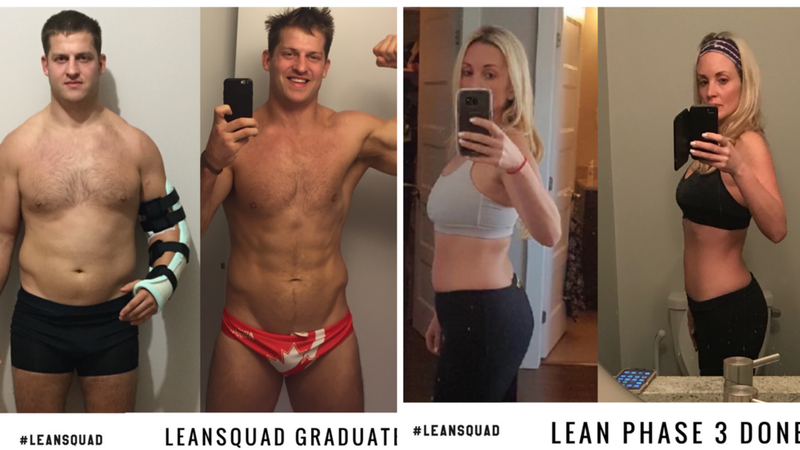 The LEANSQUAD is all about simplicity while keeping things extra tasty. So, when I made this dish, a lot was going on (mainly my son running around like a maniac) so I decided to use a few healthy lean hacks to make the meal super quick. Firstly, I used in a whole chicken instead of BBQ’ing my own chicken. Secondly, I used frozen cauliflower rice as the base because, well, honestly, frozen cauliflower is SO EASY and always makes a great addition to the meal. It also keeps it low carb, yet leaves you feeling fuel. So, now you know my lean trick for this meal. However, I have still included a recipe for BBQ’ing the chicken if you like! In a bowl, combine 1/4 cup olive oil, 1 teaspoon lime zest, 1/4 cup freshly squeezed lime juice, minced garlic, 2 teaspoons of cumin, chili powder and salt and pepper. Whisk together ingredients and set aside 2-3 tablespoons of marinade for later. Place chicken breasts in the bowl and toss around until chicken is thoroughly covered. Spray the BBQ with cooking spray and heat at medium-high. LEAN TIP: I was crunched for time so instead of firing up the BBQ, I bought a whole chicken, shredded into small pieces, and then simply added to the taco bowl with seasoning. Remove the chicken from the marinade and season with salt and pepper. Grill the chicken for about 4-6 minutes per side and baste with the remaining marinade. Ensure chicken is fully cooked (no longer pink on the inside), remove from the grill then slice into strips. OR if your using the lean hack, shred the whole chicken into bite size pieces and season with some cumin, Chile powder, lime, lime zest, a dash of olive oil and salt and pepper! While the chicken is grilling, prepare the salsa by dicing the avocados, red onion, diced tomato, red pepper and cilantro. Add the drained can of corn and toss together in a large mixing bowl and add in remaining 2 tablespoons of olive oil, lime juice, cumin, minced garlic and red pepper flakes. Place chicken over bed of cauliflower rice, brown rice or quinoa. Top with fresh avocado corn salsa, drizzle with lime juice and enjoy! For more leanmazing recipes, TAILORED TO YOU and YOUR BODY, click the link below and sign up for your own custom #90DAYLEANPLAN today. Every meal plan is pre calculates your macro and micro nutrients so all you have to do is cook your favourite lean meals, and you will be feeling healthier, fitter and leaner in no time!